In Massachusetts, larceny and shoplifting charges can lead to a variety of penalties. The punishment that can be handed down in a Massachusetts criminal court depends on a number of factors, such as the amount or value of the property involved, if the accused has past convictions, and the age of the victim. Stephen M. Forlizzi is a larceny criminal lawyer in Massachusetts and has many years of experience helping Massachusetts citizens. We fight to help those accused of larceny or shoplifting protect their rights and get the due process to which they are entitled to under the law. Our ability to investigate your case and negotiate on your behalf can make all the difference. Massachusetts businesses take shoplifting very seriously. Shoplifting entails more than walking away with items that were not paid for. Switching tags on items or giving discounts to someone who isn’t eligible are also forms of shoplifting. Even a first time offense can be costly and affect your reputation. For a first offense charge of shoplifting an item valued under $100, the penalty can be a fine up to $250. A second offense can lead to a $500 fine. Subsequent offenses can lead to a $500 fine and jail time up to 2 years. For items valued over $100, the fine jumps to $1000 and 2.5 years in jail is possible. Aside from the criminal penalties, a store in Massachusetts can also seek civil damages of up to $500 over the value of the items taken. The Law Office of Stephen M. Forlizzi is dedicated to helping anyone facing a shoplifting or larceny charge. The fines and possibility of jail time can affect your career, reputation, and your family. 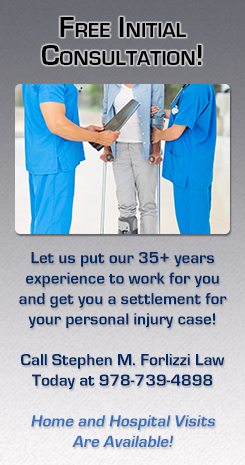 With solid and experienced legal representation, you can fight the charges and put the incident behind you. Call our firm for a free consultation so we can explore the details of your case and help you get the best possible outcome. For a Complimentary Consultation Call - 978-739-4898. To Contact Us Via E-mail Click Here.